Casual Spring Favorites for Thursday Fashion Files. Link Up! 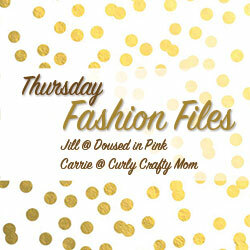 Welcome to Thursday Fashion Files with Jill at Doused in Pink and Carrie at Curly Crafty Mom! We are excited to have you here and would love to have you link up one of your latest outfits with us. 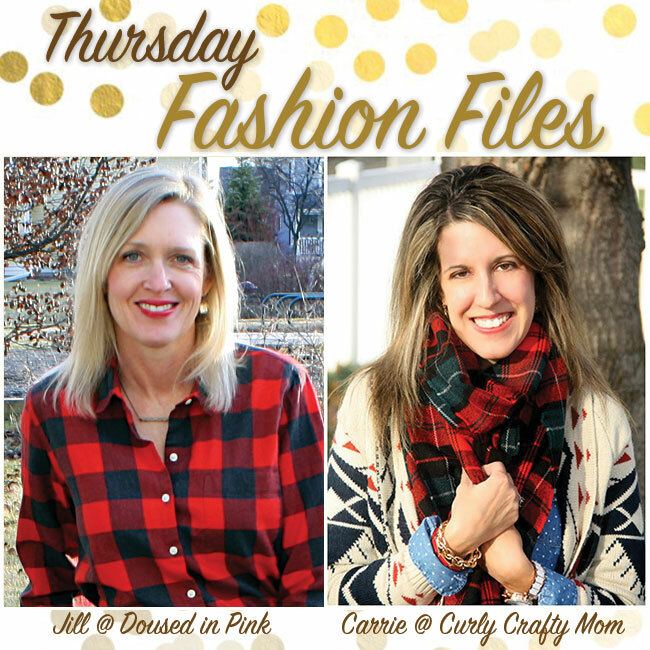 I am your co-host today as well, so join myself as well as Carrie + Jill and link up a fashion or beauty-related post today or for the next few days while the link up stays open. Thank you. We are always looking for Co-Hosts for Thursday Fashion Files. If you haven't signed up to Co-Host, but are interested, sign up by clicking HERE. If you have already signed up for a Co-Host spot, take note that the party is now starting on Thursday at 12:00 A.M. instead of Wednesday evening. It is my pleasure to co-host with Jill and Carrie today who are Mommy Bloggers like me. They both are super stylish and chic on a real mom budget but what I enjoy also is that their blogs are life+style and have a little bit of everything in them. Carrie for example is the queen of DIY especially monogrammed stuff (Carrie, you know what to give me as a future birthday gift, if you ever want to... lol) while Jill always has some fantastic reviews on beauty products she receives on the mail each month and more. Even better to co-host with them on this jubile birthday week, where every day I am doing some type of collaboration with some of my favorite bloggers and blogging friends. Since this is my Birthday week and I wanted to post dressy, girly outfits featuring dresses and skirts all week, I had planned to post one of my favorite dresses (a white work sheath, which I wore a couple of days ago, to work), but after a rough day with Vivian yesterday and since I don't have the photos ready and edited, I decided to post this casual outfit today which feature some of my favorite Spring clothing items. And of course what better time to feature Closet Favorites than during your Favorite Month and on your Birthday Week, for that matter. Plus I can see Jill - one of my co-hosts today - totally wear this outfit or something very similar. Of course my Marled, Relaxed Joggers are one of my Spring Favorites. The Quilted Baby Pink Vest (which I recently thrifted and it was almost new) has become a favorite though my puffer/quilted vest collection is large. These round-frame sunnies are my Favorite Sunglasses at the moment. And the Red+Black Lace Oxford Shoes are my Favorite Oxford Flats (though I own a few pairs of oxford flats, too). I paired all of these items with a Graphic Sweatshirt, while being on mom and errand duty on a weekend day. Today Jac is featuring Graphic Tops for Spotlight of the Week so this is perfect. What do you think of this as a running errand, casual weekend outfit? Are joggers, oxford shoes, quilted vests and graphic tees or sweatshirts part of your casual Spring Wardrobe, also? And here is another similar outfit featuring these joggers, another vest and another pair of sunglasses. Winter White "Hello There", Long-Sleeve Sweatshirt: Old Navy (similar w/ big anchor print, love this), (in solid winter white w/ peplum by J.Crew, great deal, love this), (heart-embossed option by Love 21, best deal, love this), (similar, Splurge). Baby Pink, Quilted Vest: Thrifted (New) (similar by Ralph Lauren, great deal, love this), (neon pink option by Columbia, best deal, love this), (sporty option, great for running). 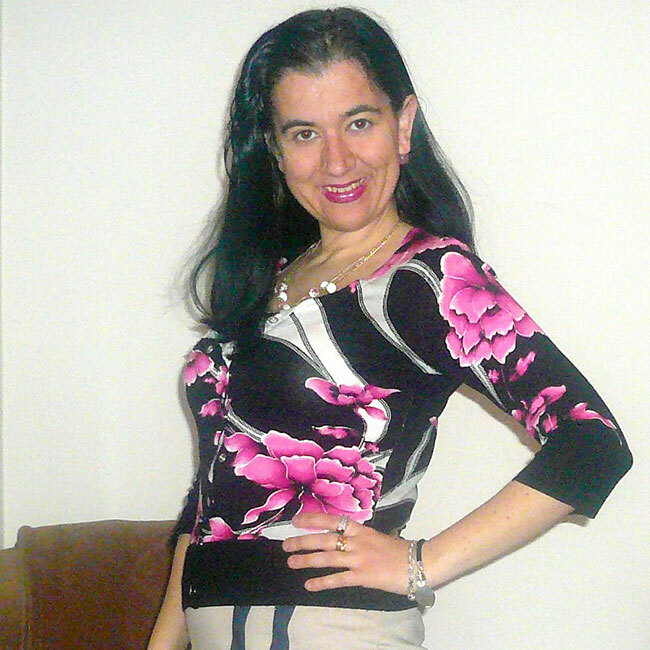 Gray, Tweedy, Knit, Ankle-length, Jogger-Style Pants: H&M (similar by F21, best deal), (similar, great deal), (similar dressy option by Guess, on sale, love these), (gorgeous option by Topshop, love these). Tiny, Real Gold Hoops w/ Real Diamonds: A Fine Jewelry Store (gifted from the husband) (very similar, Splurge). (very similar, Steal), (similar gorgeous option by Judith Ripka, great deal, love these). Ada from Elegance & Mommyhood is our co-host this week. Ada turned 35 this week and is having a special Blog Birthday Party week on her blog! Ada is a bargain fashion blogger and also a mom to a sweet girl named Vivi. She always leaves the sweetest and most thoughtful comments. Be sure to stop by to wish her a happy birthday if you haven't already! Now let's get linking! Thank you for linking up! Jo-Lynne, Lauren, Linda, Megan, Nicole, Rachel, Sarah, Tara, Tiffany and Vicki. Stop by here tomorrow for our 5th week of the Budget Babes: Spring Trends with Rachel and Maria where I am featuring (well, all 3 of us are) yet another gorgeous +new dress.